This novel is based on the Sarajevo Haggadah, an ancient manuscript dating from around 1350, originating in Barcelona, Spain. It is now the property of the Sarajevo national museum. That much is true. However characters and the plots of the sections of this novel are mostly fiction based occasionally on facts. The author researched meticulously and then let her imagination fill in the rest, as little is actually known about the origin of the Haggadah, or the route it took to reach Sarajevo from Spain. It took only a few chapters to hook me on the story and book format. It starts with Hanna Heath, a book conservator from Australia arriving in Sarajevo to examine the Haggadah. This was at the time of the Bosnian war. After a chapter getting to know Hanna, the book turns to a chapter from the Haggadah's history. Then it goes back to a chapter about Hanna. Back and forth, back and forth, we get glimpses of the fictional history of the book, then a scene or two with Hanna, the fictional book conservator. I enjoyed reading the book and liked the presentation of the plot and stories about the book's past. Some of those stories suffered from lack of a likable character, but they were realistic in a way that makes one grateful not to have been there. I took off one star because I didn't appreciate the sexual scenes. I don't like them unless they are very brief and indirect and very necessary to the plot. 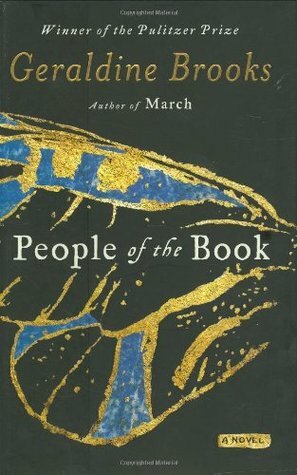 Sign into Goodreads to see if any of your friends have read People of the Book.